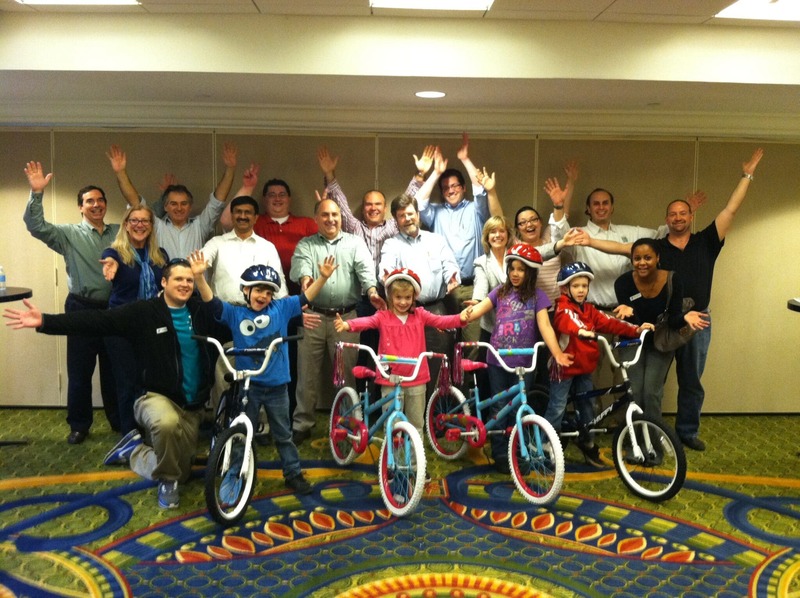 InfoComm International held their regular Executive Committee meeting near Washington, DC and included a Build-A-Bike team building event as a way to give back to the community and have some fun together. InfoComm International is the leading nonprofit association serving the professional AV communications industry worldwide. Founded in 1939, the association offers industry expertise and market research serving press and others seeking information about the industry. As a small group of 13 people, the leadership of the team wanted to make sure that the group would still have a great experience of the event. We were able to customize the agenda to fit the size of their group, as we can do with any size group, and give them the same great experience on a smaller scale. The Build-A-Bike® team-building activity is a high-energy, really fun workshop that gives the participants a chance to engage together in “play with a purpose” exercises. As high level managers, this team collaborated naturally and were quickly successful in every activity. 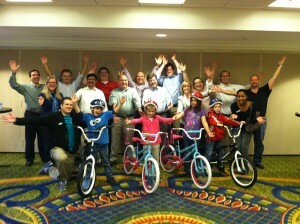 At the end of the event, the group had built four bikes and had a really great time together. The excitement in the room ratcheted up another notch when the YMCA of Fairfax County arrived with four local children who were the ecstatic recipients of the bikes! While most of the participants in this Bicycle Team Building Event were from outside of the Washington, DC area, they had deep appreciation for the difference their contribution made locally.